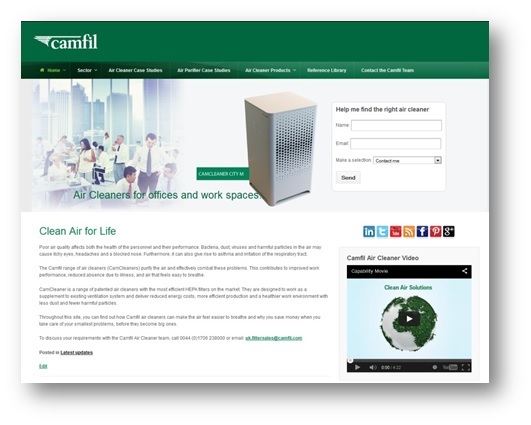 Here at Camfil UK we have launched a new Air Cleaner website to showcase our range of products for the domestic, commercial and industrial sectors. The new site is dedicated to the CamCleaner which is a range of patented air cleaners with the most efficient HEPA filters on the market. They are designed to work as a supplement to existing ventilation systems or as a stand-alone air cleaner where no HVAC systems are in place. They deliver reduced energy costs, more efficient production and a healthier work environment with less dust and fewer harmful particles. The informative new portal will provide our subscribers with the freshest insights and unlimited access to exclusive content including; datasheets; thought leadership pieces; industry news articles; whitepapers and case studies.